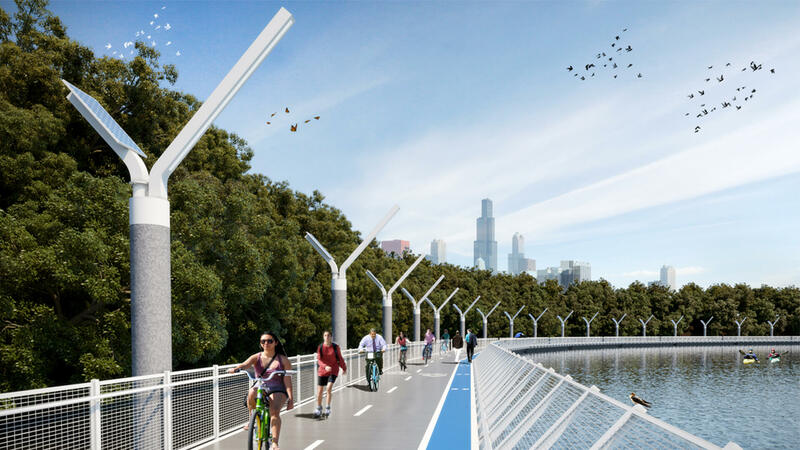 The Chicago River Path would safely and swiftly connect cyclists from the loop to the North Shore Channel via an off-street spoke path approximately 7 miles in length. Avoiding roads, intersections and bridges, the path would integrate with current and future river projects. At a width of 16’, the path would occupy less than 10% of the current river width. Cycling trip times into and out of the loop are estimated to be reduced by 35% from current street times. As Chicago continues to position itself as one of the greenest and most sustainable cities in the world, it will increasingly need to be more ambitious in its vision of the future. As enormous strides continue to be made in the energy use of our buildings, the fuel efficiency of our vehicles and the amount of waste reaching our landfills, there is an additional area of the metropolis in need of improvement: our cycling infrastructure. As cycling ridership continues to grow, the need for more rideable paths grows with it. With more mileage of safe, protected bike lanes than ever before, Chicago continues to make riding a more viable option for commuters and recreational riders alike. The Chicago River Path would accelerate ridership across the city. By providing a viable alternative to traveling alongside traffic on congested streets. With minimal impact on aquatic life and river ecology, the Chicago River Path would serve as both a transportation route and a park space. Integrated into the existing network of paths, streets, boulevards, avenues, and routes, the Chicago River Path will be an alternate off-street spoke route that will make it safer and quicker for cyclists and pedestrians to navigate the city’s north side. Located between the existing Milwaukee and Clark Spoke routes, the new River Path will capture existing ridership because of its increased efficiency for inbound loop commuters and its tentacle-like integration back into the rider’s place of origin.